“Placemaking” in Tending: I am helping Ross/SCA rejuvenate Tending so it becomes a place to chill out, inspire, display art, value ecological aesthetics, grow food, learn/share gardening/permaculture skills, etc. But I can still keep you posted with some exciting news!!! I lead 16 aspiring permaculture designers at Tending last Saturday, and we spent the whole day measuring, testing, observing, and getting our creative permaculture juices ready for Tending II – the design! Now, that’s phase one underway. Yay! In parallel, we’ll run a design session with you, SCA students and staff, Tending alumni and friends. 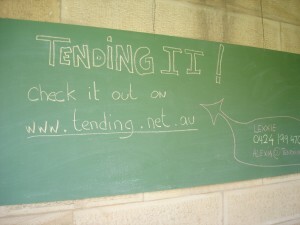 So mark your diary and RSVP to alexia[at]tending[dot]net[dot]au on or before 28 May! Come with your ideas, pens & papers and your lunch. 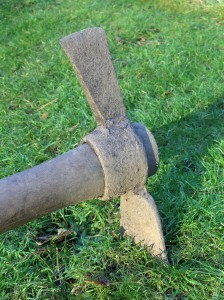 As part of the soon-to-come transformative work, I started sorting out a few things in the garden, collecting stakes, regrouping pots that were lying around under ferocious couch grass, inventorying plants species that needed to be saved, starting analysing the site for upcoming permaculture design… A busy morning for me! I also started assessing the amount of work and the tools needed to convince couch, kikuyu and nut grasses (and many more unidentified ones!) 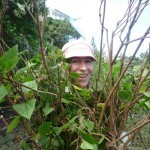 to recede and let us grow food instead of invasive runners! So here is an appeal! Failing that a flock of hungry chickens? Pigs and chickens would do magic at controlling the invaders and helping us cultivate the soil. 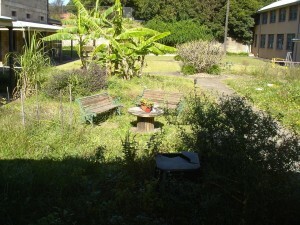 But for reasons you can easily anticipate, they may not be quite entirely welcome on the school grounds! We’ll be back at Tending next Thursday! 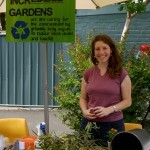 I am Lexxie – I am a permaculture teacher, gardener, mother of one, jack of all trade and generally fun to be around ! More on me here. I’ve already met some of you and I hope to see you all soon in the garden. You might have also met Jocelyn who’s a permaculturist and gardener, a community development worker, my dearest friend, and even more fun to be around ! Read about Joss here. Together, we will be working on the Tending ‘make-over’ and we will be tending the garden every Thursday morning till lunch time. 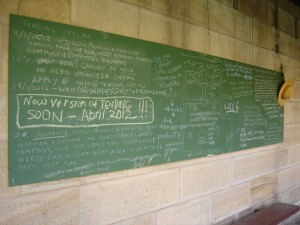 We’ll also update this blog as well as the board inside the courtyard.